As the 2016 PBA Commissioner’s Cup enters the deep waters of the elimination round, each game carries higher stakes, and each performance is magnified for the fans to scrutinize. Foremost, of course, is the production of the imports, on whose shoulders rest much of their teams’ fortunes. Which reinforcements have been up to snuff and which have underwhelmed? Let’s see here! *Stats are accurate as of March 21, 2016. - This 6’9 Virginia native has put up big numbers in his first two PBA games, but, unfortunately for the Batang Pier, these haven’t translated into Ws. That’s mostly because losing both Stanley Pringle and Terrence Romeo is too much for any franchise, but even in the midst of such circumstances, Taggart has been able to impress. - Thornton is playing at a slightly higher level than he did last season, but the Road Warriors have been so inconsistent that they have remained a bubble team throughout this conference. NLEX picked Thornton because they had faith guys like Asi Taulava and Sean Anthony could prop up their frontline against the other teams’ giant imports. So far, however, that hasn’t been the case. - The knock on Wilkerson when he was still playing in the KBL was that he loved shooting the three too much. We see that here with SMB, but at least he’s making 3 treys a game, which justifies his love affair with the rainbow territory. He hasn’t scored lower than 27 points and hasn’t grabbed fewer than 10 boards in any game so far, and that’s augurs well for the Beermen’s hopes of bagging their first Commish Cup title since 2000. 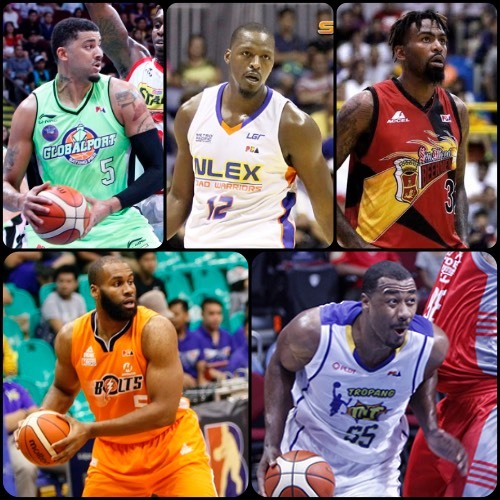 - NLEX big man Asi Taulava compared Onuaku to Iranian behemoth Hamed Haddadi, and that’s a fair comparison considering Onuaku has been near unstoppable in the paint and has been a beast around the basket. He has certainly been the biggest difference-maker for the Bolts this conference, and it stands to reason Meralco will only go as far as he can take them. - The 33-year old 6’10 import from Illinois continues to impress, despite the inconsistency of most of his local teammates. Simon’s numbers have taken a bit of a dive after his first two stellar outings, but he still remains, overall, the best import this conference. He’s a daily double-double who gets it done on both ends of the floor and is able to complement his team’s existing skill-set. TNT has also won 3 of their last 4, and that’s a good sign heading into their last 3 games of the elims.